Sign up and receive Property Email Alerts of Houses for sale in Grayleigh, Westville. On the market for the very first time, this exclusive Westville residence offers everything your growing family could ever need in a home. From its convenient and secure location, beautifully landscaped verge and above road position, to the ample guest parking, advanced security features, manicured gardens, swimming pool, jacuzzi and tennis court - this home has it all. With over 620 sqm of floor space, the house itself is well appointed and includes four large bedrooms, three and a half bathrooms, private study, three lounges, two dining rooms, snooker room, covered entertainment patio, modern kitchen with separate scullery, laundry room, domestic quarters, and three garages. Situated within the secure RCA (Rosebank, Chase, Audley) residential community; with boomed access control, a single entry/exit road and regular security patrols; the neighbourhood is conveniently located in the heart of Westville and is zoned for all central Westville schools. Upon entering the property, you are warmly greeted by a beautifully landscaped verge, solid wood auto gate, three extra-length garages (with direct access to the house) and a driveway with ample guest parking. Up a short flight of stairs, you are presented with a manicured lawn, covered patio and stunning treetop views. A set of double french doors welcome you into the home and open into the entrance hall that boasts high ceilings, chandeliers and a luxuriously large formal lounge and dining room that is light, airy and open plan in design. A short passageway then leads you into the kitchen and breakfast dining area that is highlighted by a magnificent picture window that frames a tropical atrium and brings both nature and sunshine into the home. The kitchen is contemporary in design and comes complete with a separate scullery, black granite countertops, breakfast bar, stain glass display cabinets, double eye-level oven and a kitchen island with an AEG gas and flattop combination stove. The kitchen flows effortlessly into the snug Tv lounge and then onto the sleeping quarters with three spacious bedrooms and two stylish bathrooms. The Master Bedroom is bathed in natural light, grand in size and includes a walk-in dresser and air conditioning. The modern, black and white, ensuite bathroom is well-sized and features a double granite vanity, sunken bath and a walk-in rain shower with a large picture window overlooking the gardens. A grand staircase then leads downstairs to the fourth bedroom. With french doors that open out onto the patio and gardens, walk-in dresser and French country-style ensuite bathroom, this spacious downstairs bedroom would make an ideal guest suite or private teen pad. Downstairs, you will also find a large open plan entertainment room, with both a lounge and a snooker room, as well as a private study with built-in desk and cabinets. The room then leads out onto the covered entertainment patio which boasts downlighting, built-in granite server and space for both an outdoor lounge and dining area. 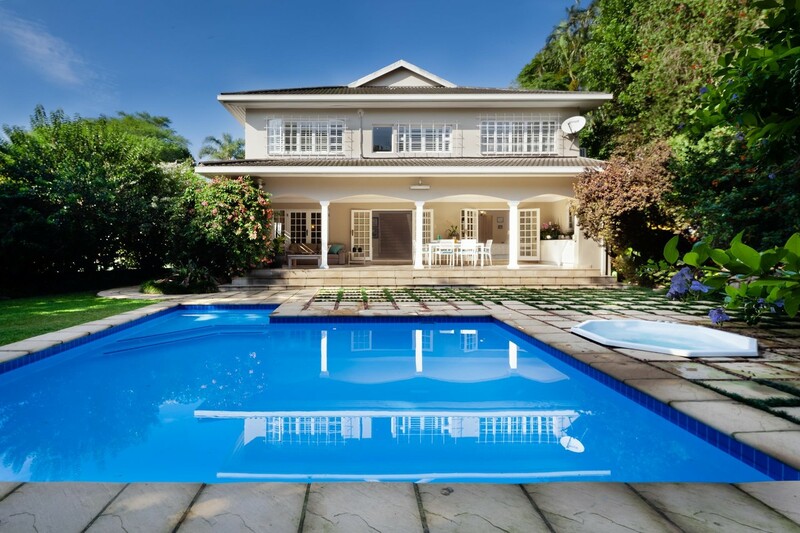 With complete privacy from the surrounding trees and foliage; along with the tranquil outlook over the manicured gardens, sparkling blue swimming pool and jacuzzi, the patio offers the perfect place to light a braai and host family and friends. In addition to the top-notch neighbourhood security, the home offers peace of mind with its electric fencing, CCTV system, and stackable security shutters throughout. Sign-up and receive Property Email Alerts of Houses for sale in Grayleigh, Westville. Disclaimer: While every effort will be made to ensure that the information contained within the Shelley Residential website is accurate and up to date, Shelley Residential makes no warranty, representation or undertaking whether expressed or implied, nor do we assume any legal liability, whether direct or indirect, or responsibility for the accuracy, completeness, or usefulness of any information. Prospective purchasers and tenants should make their own enquiries to verify the information contained herein.